Samantha Weber - Senior Biologist - Condor Country Consulting, Inc.
Samantha Weber has seventeen years of experience in conservation biology, including natural resource management and planning. 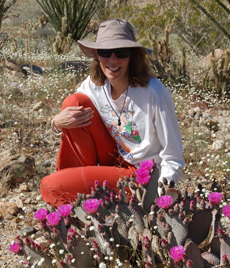 Ms. Weber has worked in coastal and inland California ecosystems (reptiles and amphibians, small mammals, carnivores, vascular plants, invertebrates, breeding birds, shorebirds, and air quality), in the marine rocky intertidal community (plants, animals, algae), and in wadeable streams (benthic macro-invertebrates, physical and chemical parameters). At CCCI, Ms. Weber primarily writes and edits environmental documents (biological assessments, natural environment studies, habitat assessments, etc. ), but also assists with special status species surveys, habitat assessments, and wildlife and environmental compliance monitoring. Ms. Weber also manages the company web site. Outside of her CCCI work, Ms. Weber edits for non-profit conservation organizations, and writes about biology and conservation. Before coming to CCCI, Ms. Weber worked for thirteen years in the National Park Service (Yosemite, Mount Rainier, and Cabrillo) where she partnered with local, state, and federal government agencies, universities, private consultants, volunteers, and natural and cultural history associations. She was a resource chief at Cabrillo NM, and later directed a natural resource inventory and monitoring program for eight national park units in the Pacific Northwest. At Yosemite, Ms. Weber focused on protected area planning and compliance.